We’re kicking off the spring semester by offering a range of trainings for our tutors. Whether you’re a seasoned pro or a spring chicken, we invite you to take advantage of the unique training opportunities listed below. During these trainings we welcome you to discuss any challenges you’ve faced in the classroom, and learn from fellow 826 volunteers and staff how to best support young learners and create an environment conducive to progress and success. You’ll leave with a new toolkit of strategies and maybe some new tutor pals. RSVP by signing up on our volunteer calendar or by contacting Volunteer Engagement Coordinator Alyssa Aninag at alyssa@826valencia.org. Do you ever find yourself stumped while trying to tutor a student experiencing frustration, stress, or simply fatigue? 826 Valencia staff will lead this training on how to best support students of all ages and create an environment conducive to learning. This is an excellent opportunity to discuss any challenges you’ve faced in the classroom, and learn from fellow 826 volunteers and staff. Did you know that about a quarter of students in the San Francisco Unified School District are English Learners? Attend this tutor training to sharpen your skills in adapting your approach to meet the unique needs of each student you encounter in our programs. You’ll learn how to create an encouraging environment, bolster student strengths, and increase their independence as learners. We’ll also take a look at student writing samples and use 826’s new tutor tool, “The Map,” to chart a course forward. Are you interested in unpacking these complex terms? Unsure how to talk about race, class, and gender with students? Want to help young people to process difficult current events? Please join us for a training that covers these topics and more! 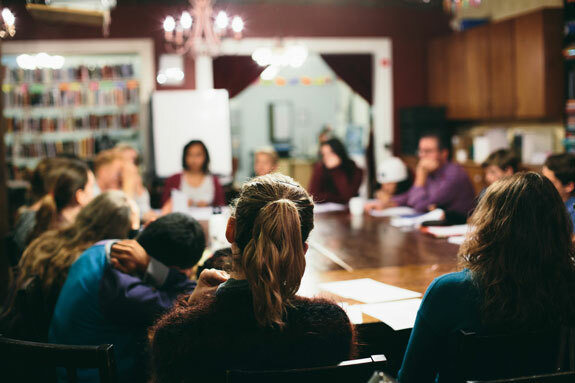 In this training, we will explore 826 Valencia’s commitment to inclusion and the importance of asset-based language. You will also learn culturally responsive and compassionate questioning techniques, as well as strategies to help students think critically about incorporating their own identities into their writing.